Last weekend my entire family visited our native town Chidambaram, a municipality in the Cuddalore district of Tamil Nadu, South India. Chidambaram is famous for its Sri Nataraja Temple, dedicated to Lord Shiva in the form of Cosmic Dancer. It is one of the most ancient shrine in India and has a great historic and cultural significance to it.The magnificent temple is spread over 40 acres of land.Our family temple is in a small village about 2-3 kms from Chidambaram called “Usupoor”. 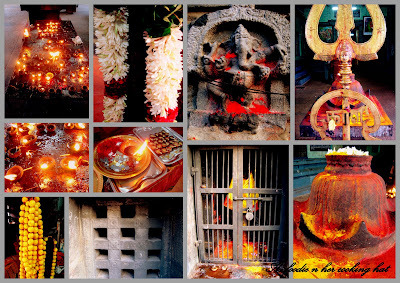 The gods at Usupoor are our guardian spirits (Kaval Deivam in Tamil). Its a practice to visit Thillai Kali Amman, holy temple located towards the North side of Sri Nataraja Temple before we see our family god. There is an interesting story that my granddad shared with me about the erection of this temple in the outskirt of the town. It seems there was an argument that who is superior among Lord Siva and his wife Shakthi.In order to clear this doubt, Shiva decided to perform a dance at Chidambaram, infront of Lord Vishnu and Lord Brahma. Both Siva and Sakthi were performing and when Siva was about to get defeated, he did “Oorthava Thandava” (one of the position in dance where one raises their leg above their head). This couldnt be performed by Sakthi due to shyness and awkwardness. Since she couldnt do it, she accepted her defeat and in anger went to the extreme end of the town. Her deity at Thillai Kali Temple is a deity in anger and has four faces. It seems that the anger was pacified by Brahma’s chanting and singing in praise of her. After our Pooja at Thillai Kali, we headed to Usupoor. Its a very small temple with village deities in the form of a huge, fierce statue. Most of these kinda temples have a simple worship area. The deity holds sickles or trident or lance in their hands.Its a beautiful temple with a small pond behind it. We cooked the Sakkara Pongal (Sweetened rice and lentil mixture) and gave it as an offering to God. 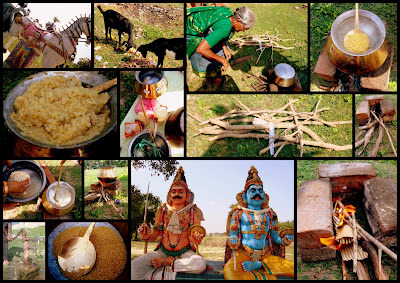 Generally in these temple, the poojas are done by Non-Brahmin priests.The picture below depicts the way we arranged the simple bricks to a stove, collected the dried twigs and ignited the flame and finally cooked the Sakkara pongal. 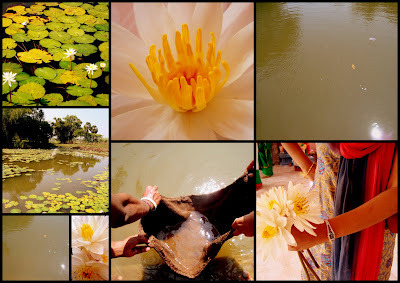 My cousin V and I walked to the temple pond and plucked few White lotus for the God and tried fishing with the sack (we manged to find). We caught few tiny fishes but we put them back in the water immediately. We enjoyed this game despite the scorching heat. It feels so great to go back to your native soil and experience that feeling-connected-to-roots emotion. The number of familiar faces and warm greetings and their hospitality makes you feel like visiting them often. We thoroughly enjoyed our short visit to Chidambaram,my ancestral land and I am sure that everyone in my family would love to go back soon. My post for today is Peratal Curry. Yet another dish from my grandmum’s kitchen. This dish seems to have originated in her family and she says that her grandmum used it to cook it for them with meat and vegetables. Since we were visiting temple, she made the vegetarian version for us. Add 2 cups water to channa dhal and potatoes. Pressure cook them for 3 whistles and keep them aside. Grind the coconut and cumin seeds to a thick paste. Keep them aside. Add oil to the heated cooking vessel. Add the whole masalas and let them cook for 2-3min.Add the onions, whole garlic and little salt to the tempered oil and cook for 5-10min on low flame. Now mix in the tomatoes and cook till the oil separates from them. Sprinkle the turmeric powder and chilli powder. Cook till the raw smell disappears. Add in the chopped vegetables and give it a complete mix. Add 1 cup water and cook for 15-20min till the vegetables become tender. Cook on medium flame.Add in the coconut-cumin paste now and cook for further 10min. Finally add the boiled channa dhal and potatoes to the vegetable gravy. Mix them thoroughly and turn off the flame. Note: This dish can also be made with meat. You can pressure cook the meat along with channa dhal and potato and finally add it to the vegetable gravy. Nice to know about your kula-deivam. The peratal curry is something I've not heard of before.. looks & sounds delicious. It is always a lovely feeling when you go back to your roots. I will be visiting my country in a couple of days and I miss it so much. Your grandmother’s curry sounds delicious. Love the kaval deyvam snap, every place has one! Sounds very remote place too… The curry sounds good ! pls trail back to me, got soemthing for u, dear. This looks delicious. Love the traditional recipe. Thanks for posting it! It’s wonderful to be able to go back home, to our roots. When I’m really lost, I go home to find myself and the warm in my soul is always restored. Nice to read your post. This recipe is new to me. looks good. Very nice post giving useful info n intro abt Chitambaram Natarajar. I too visited this temple a couple of years back..
Hope u all enjoyed the trip and yr family dish…yummy one. How blessed your are to be able to go visit your ancestral land… what an amazing experience. Wow u had a great time there. Curry looks good. Nice post.Loved reading about the temples.The curry is definetely new to me. This was fascinating to learn a little bit more about your culture! Thanks for sharing! Oooohh… Lovely clicks and ur native place looks lovely. The pond, lotus, goat, greenery.. Visiting our native place and enjoying their heritage is a lovely experience. Enjoyed reading the post. Hi Viji,your peratal is yum. Its a family dish of our's too!! We are mudiliars from B'lore and we too cook this often with meat. The Channa dal substitute is great!